TEL AVIV, Israel, March 27, 2018 /PRNewswire/ -- A clinical trial led by a team at the Research Institute of the McGill University Health Centre (RI-MUHC) in Montreal, published today by the American Journal of Kidney Disease (AJKD), showed that teen and young adult kidney transplant recipients who used Vaica Medical's SimpleMed, a digital health, medication management and adherence solution, in combination with coaching, had 66% higher adherence to anti-rejection medicine. Click here to view the article. As per the National Association of Chain Drug Stores website, nonadherence causes nearly 125,000 deaths, 10 percent of hospitalizations and costs the healthcare system between $100–$289 billion a year in the United States alone. And according to the website of Seattle Children's Hospital Research Foundation, adolescent rates of non-adherence are 60% higher than adults, and adolescents are 1.6 to 2.6 more likely than younger individuals to have rejection. The goal of the TAKE-IT study was to find out if a program of regular coaching, review of electronically-monitored adherence, and the medication management and reminder system provided by Vaica's SimpleMed would help young people to take their life-saving medications better. Dr. Bethany Foster, MD, MSCE, Pediatric Nephrologist, Montreal Children's Hospital, McGill University Health Centre (RI-MUHC), principal investigator of the TAKE-IT studies and primary author of the article published today in the AJKD said, "Now that the trial is complete and showed that using the electronic pillbox, in combination with coaching, helped young people adhere to a strict schedule of anti-rejection medication, I hope to be able to move this intervention into clinical practice." 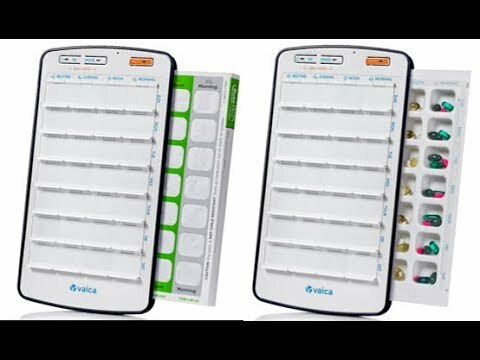 Vaica CEO Mr. Tomer Gofer said, "It is not enough to simply have an electronic reminder to take your medication. They are too easy to ignore and dismiss. Patients may be less likely to ignore or dismiss reminders if they know that their care team will see how often it happened. The study published today further confirms that this three-way communication between the patient, the system and the human support team makes a measureable difference." Pediatric departments at eight leading medical centers in Canada and the United States enrolled a combined eighty-one patients in the TAKE-IT intervention group (median age 15.5 years; 56.8% male) and 88 in the control group (median age 15.8 years; 61.4% male). All participants met with a study coach every 3 months for 15 months. Those assigned to the TAKE-IT intervention group could choose to receive text message, email, and/or visual cue dose reminders, and reviewed adherence data from the prior 3 months with their coach. Those in the control group used the electronic monitor but received only general social support with no alerts or notifications. Adherence improved and was 66% higher among patients who received the intervention than among controls. Better adherence is likely to lead to better graft survival. Vaica also announced today that it has been chosen to design the customized, medication management and adherence solution in a follow-up study called Teen Adherence in Kidney Transplant Improving Tracking to Optimize Outcomes (TAKE IT TOO). In TAKE-IT TOO study investigators will collaborate with Vaica, and with patients, parents and healthcare professionals to design a medication monitoring and adherence support system specifically for young people, adapt the TAKE-IT intervention for use in clinical practice, and test the new device and intervention in a pilot trial. TAKE-IT TOO is being funded by the National Institute of Health. Click here for more information. Dr. Foster continued, "It is great to see that our intervention was effective in improving medication adherence. The electronic pillbox was a key part of the intervention, so it was really important to work in partnership with Vaica. They were able to customize the features of the pillbox to meet our needs. However, there is still some work to do. Participants of TAKE-IT told us that they thought the electronic pillbox could be improved. With TAKE-IT TOO, we are continuing our partnership with Vaica to design an even better pillbox and tracking system by working closely with patients, parents and healthcare professionals." Vaica Medical is helping to solve the hundreds of billion dollar, global medication nonadherence problem with digital, medication management and adherence solutions for pharma and specialty pharmacies. Vaica's distinctive solution includes a software/hardware combination that ensures accessibility to both patient and caregiver, the possibility to customize a product to the requirements of any therapeutic area as well as a particular patient's needs and real-time notifications sent to select caregivers if a dose is missed in order to empower a relevant, proactive intervention. Vaica's solutions have been tested at 15 world class medical centers, reporting a 92%-98% success rate. Vaica's solutions are commercially available worldwide. Click here to see how SimpleMed+ for multi-dose medication works. Click here to see how the new Capsuled for specialty medication works. Follow us on Facebook, LinkedIn and Twitter.